Amr Diab was born on 11 October 1961 in Port Said, Egypt into an artistic family. His father, Abdul Basset Diab, worked for the Suez Canal Corporation and was the chairman of Marine Construction & Shipbuilding in the canal. Diab’s father played a huge role in igniting the early sparks of musical inspiration towards Diab’s early stages in his professional music career. Diab, at the age of six, had his first shot at fame when he sang the Egyptian National Anthem “Bilady, Bilady, Bilady” at the annual 23 July Festival in Port Said. As a result, he was rewarded with a guitar from the governor of Port Said, and began to become recognised nationally. Diab graduated with a bachelor’s degree in Arabic Music from the Cairo Academy of Arts in 1986. Diab released his first album entitled Ya Tareeq in 1983. Diab’s second album, Ghanny Men Albak (1984), was the first of a series of records he released with Delta Sound, including Hala Hala (1986), Khalseen (1987), Mayyal (1988), Shawa’na (1989), Matkhafesh (1990), Habibi (1991), Ayyamna (1992), Ya Omrena (1993), Weylomony (1994), and Rag’een (1995). In 1996 Diab released his first album with Alam El Phan entitled Nour El Ain, which proved an international success and gained Diab recognition beyond the Arabic speaking world. Diab recorded four more albums on the Alam El Phan label including Amarain (1999) on which he collaborated with Khaled (on the song “Alby”) and with Angela Dimitriou (on the song “Bahebbak Aktar”). In the summer of 2004 Diab, having left Alam El Phan, released his first album with Rotana Records, Leily Nehary, which he followed up with the hugely successful Kammel Kalamak (2005), and El Lilady (2007). September 2011 saw the release of his album Banadeek Taala, produced by Rotana. In February 2011, Amr Diab released his hit single “Masr Allet” (Egypt spoke). In 2012, Diab hosted the first Google Hangout in the Middle East during his performance in Dubai. In October 2014, Amr Diab released his album “Shoft El Ayam” which topped his last album “El Leila” and again became the best selling album in Egypt in iTunes and Rotana. In July 2015, Amr Diab released the music video from his song “Gamalo” from his album “Shoft El Ayam.”in March 2016 he released his last and current album “Ahla w ahla” which was produced for the first time by “nay records”, after leaving rotana records. In December 2016, the organizers of Amr Diab christmas concert in Cairo announced veiled women are banned from attending the show because alcohol is served. Diab is an active fitness enthusiast. Diab is well known for his intense body building. Diab was married to Shereen Reda, from 1989–1992, ending in a divorce. They have one daughter, Nour, who became known through the song, “Habibi Ya Nour El Ain.” Diab is currently married to Zeina Ashour, with whom he has three children: Abdallah, Kenzy, and Jana. He has been awarded the World Music Award for Best Selling Middle Eastern Artist four times: 1996 for album Nour El Ain, 2001 for album Akter Wahed, 2007 for album El Lillady and 2013 for El Leila album. He has also won (Best Egyptian Artist, Best Male Arab Artist and World’s Best Arab Male Artist Voted Online) at the World Music Awards 2014. 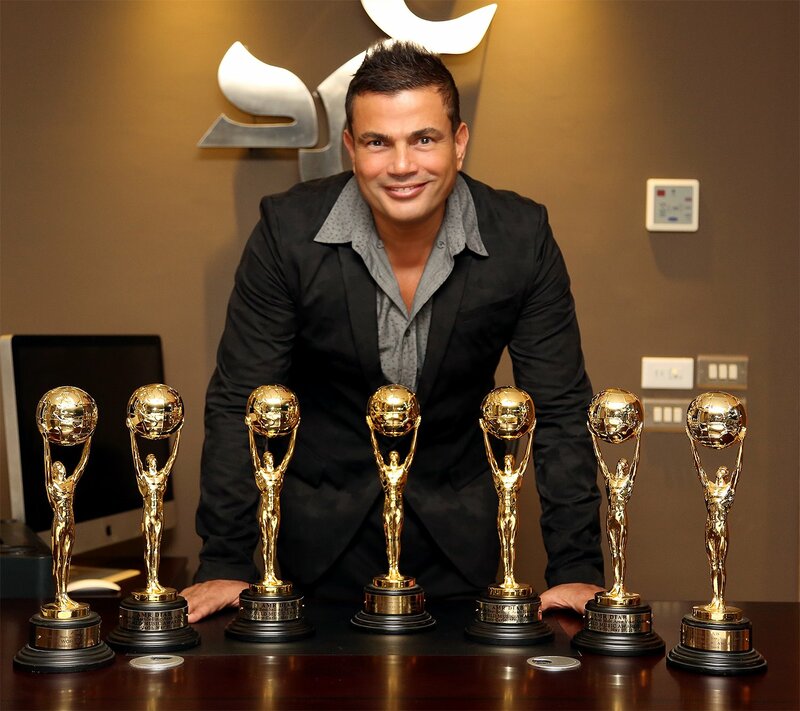 Amr Diab is the only Middle Eastern artist to have received 7 World Music Awards. He also won The African Music Awards 2009 as Artist Of The Year, Song Of The Year, Video Of The Year And Best Male Act, and won The 2010 African Music Awards as best male act and best artist of North Africa. He is the only African artist to have received 6 African Music Awards in his career. Diab won Big Apple Music Awards 2009 as Lifetime Achievements Awards and Best Singer of The Year and also won The Global Icon Award, Most Popular Artist and Best Arabic Male Artist in 2014. The album consists of 12 songs. Diab’s fame in the music industry has led him to experiment with other forms of media, such as film. Amr played himself in his first film, El Afareet, which was released in 1989. It also starred Madiha Kamel. His second film Ice Cream in Gleam (Ays Krim fi Glym), in which Diab starred in 1992, was chosen as one of the best five Egyptian musical films by the UCLA School of Theater, Film and Television. The film was featured in the UCLA Film and Television Archive’s new program “Music on the Nile: Fifty Years of Egyptian Musical Films” at James Bridges Theater at UCLA on 6, 8 and 10 April 1999. David Chute of the Los Angeles Weekly termed it “observant” and “a big leap”. His third movie was released in 1993, and was named Deahk We La’ab (Laughter and Fun). The film premiered in the Egyptian Film Festival in 1993. Amr played alongside international Egyptian movie star Omar Sharif (Lawrence of Arabia, Doctor Zhivago) and Yousra. Overall, Diab did not experience the same level of success in film that he had with his music career. Since 1993, Diab has focused on his singing career. During the 2011 uprising, some protesters criticized Diab for staying silent, and for fleeing Egypt for London. A few days after former President Hosni Mubarak stepped down, Amr Diab composed and sang a memorial song, “Masr A’let” (Egypt Said), and released it in conjunction with a music video showing pictures of the martyrs who died in the uprising. He initiated a charity campaign “Masry Begad” (“Truly Egyptian”), a social national program aimed at serving and rebuilding Egyptian society. His online radio station Diab FM often presents talks and discussions about what the Diab FM team can offer to the community as well as applying it practically by being present in different sites across Egypt with a new humanitarian project each week.